http://pixeljoint.com/forum/forum_posts.asp?TID=9378#learn - Where can I learn how to make pixel art? http://pixeljoint.com/forum/forum_posts.asp?TID=9378#create - What do I need to create pixel art? http://pixeljoint.com/forum/forum_posts.asp?TID=9378#critique - Why do people criticize my art? http://pixeljoint.com/forum/forum_posts.asp?TID=9378#hire - How do I hire a pixel artist for a project/job? http://pixeljoint.com/forum/forum_posts.asp?TID=9378#register - Why should I register and be a Pixeljoint member? http://pixeljoint.com/forum/forum_posts.asp?TID=9378#levelup - How do I level up? What does leveling up do? http://pixeljoint.com/forum/forum_posts.asp?TID=9378#ranktheme - How do I change my rank theme? http://pixeljoint.com/forum/forum_posts.asp?TID=9378#handle - Can I change my Pixeljoint handle? http://pixeljoint.com/forum/forum_posts.asp?TID=9378#avatar - How do I change my avatar? http://pixeljoint.com/forum/forum_posts.asp?TID=9378#revise - How do I revise one of my gallery pieces? http://pixeljoint.com/forum/forum_posts.asp?TID=9378#redx - Why do some of the images in the gallery display as a red X? http://pixeljoint.com/forum/forum_posts.asp?TID=9378#suggestion - How do I make a suggestion? http://pixeljoint.com/forum/forum_posts.asp?TID=9378#violation - I found a gallery piece that violates the PixelJoint rules. What should I do? http://pixeljoint.com/forum/forum_posts.asp?TID=9378#useproject - I found a gallery piece I'd like to use in my project. Can I? http://pixeljoint.com/forum/forum_posts.asp?TID=9378#donate - How can I support this fine site? http://pixeljoint.com/forum/forum_posts.asp?TID=9378#reportwhen - When should I report a comment/gallery piece? http://pixeljoint.com/forum/forum_posts.asp?TID=9378#reporthow - How do I report a comment/gallery piece? http://pixeljoint.com/forum/forum_posts.asp?TID=9378#10k - Why isn't my submission showing up on the front page? http://pixeljoint.com/forum/forum_posts.asp?TID=9378#rip - I suspect a piece of art is a rip, but I can't put my finger on the original. What should I do? http://pixeljoint.com/forum/forum_posts.asp?TID=9378#howsearch - How can I search for pixel-art in the gallery? http://pixeljoint.com/forum/forum_posts.asp?TID=9378#postpic - How do I post an image? http://pixeljoint.com/forum/forum_posts.asp?TID=9378#submission - How do I submit my art to the site? http://pixeljoint.com/forum/forum_posts.asp?TID=9378#awaiting - Why is my submission still awaiting approval? http://pixeljoint.com/forum/forum_posts.asp?TID=9378#sentback - Why was my submission sent back? http://pixeljoint.com/forum/forum_posts.asp?TID=9378#lildude - Why wasn't my Lil'Dude or Wee accepted? http://pixeljoint.com/forum/forum_posts.asp?TID=9378#sentback2 - Why was my pixel art sent back when other crap is allowed in? http://pixeljoint.com/forum/forum_posts.asp?TID=9378#submitothers - Can I submit pixels created by another as a showcase of sorts? http://pixeljoint.com/forum/forum_posts.asp?TID=9378#submiterror - I got an error when I tried to submit something! What does it mean? 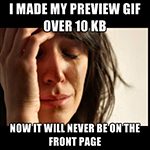 http://pixeljoint.com/forum/forum_posts.asp?TID=9378#preview - What counts as a valid preview image? http://pixeljoint.com/forum/forum_posts.asp?TID=9378#collab - Can I submit a pixel that I made with another member? Can I create a collab account? http://pixeljoint.com/forum/forum_posts.asp?TID=9378#rss - What is RSS? http://pixeljoint.com/forum/forum_posts.asp?TID=9378#irc - What is IRC and how do I connect to the PixelJoint channel? http://pixeljoint.com/forum/forum_posts.asp?TID=9378#formats - What file format should I use for pixel art? http://pixeljoint.com/forum/forum_posts.asp?TID=9378#png8 - How do I know if my pixel is being saved as a png8 or png24? http://pixeljoint.com/forum/forum_posts.asp?TID=9378#transparent - How do I make my GIF transparent? http://pixeljoint.com/forum/forum_posts.asp?TID=9378#blurry - When I zoom images in the gallery, they get all blurry. Help! http://pixeljoint.com/forum/forum_posts.asp?TID=9378#specs - How can I see the specs of an image, such as color count, frames, etc.? http://pixeljoint.com/forum/forum_posts.asp?TID=9378#challengepos - Can I tell what position I came in if not 1st, 2nd, or 3rd? http://pixeljoint.com/forum/forum_posts.asp?TID=9378#challengeedit - Can I edit my challenge entry whilst the voting is on? http://pixeljoint.com/forum/forum_posts.asp?TID=9378#challengeexisting - I have an existing piece that happens to fit in the current challenge. Can I submit it? http://pixeljoint.com/forum/forum_posts.asp?TID=9378#challengemultiple - Can I have multiple entries for a challenge? http://pixeljoint.com/forum/forum_posts.asp?TID=9378#challengeverify - How can I verify that my challenge entry conforms to the restrictions? We have links to many helpful tutorials in our ../pixels/tutorials.asp - tutorials section , appropriately. ../forum - The forum is also a great resource for learning from your peers. They often have relevant and useful information to help you along you pixel education. You only need two things: a graphics program and lot of patience. We can't help with the latter, but for the former see the ../pixels/links.asp - links section or the forum forum_topics.asp?FID=6 - resources section . If you'd like to post a job offering you can do so in the forum_topics.asp?FID=11 - job forum . You must read the forum_posts.asp?TID=671 - job posting rules before posting an advertisement. This information can also be found http://pixeljoint.com/pixels/faqs_ranks.asp - here , with a table describing what you need to do to get to each rank. Simply http://pixeljoint.com/pixels/profile_edit.asp - edit your profile and make a selection from the "Rank Theme" drop down list, then click "submit" at the bottom. The goal of this site is to provide at outlet for the thriving pixel art community. Since this is a non-profit (or negative-profit depending on how you look at it) web site, the preferred way you can keep this little operation cooking is to link back to us or tell a friend about us. Banners can be found in our ../pixels/links.asp - bannerssection . We also have a donate button on the front page and all money collected is used for competition prizes, server storage and software upgrades. Thanks for your support! There's a handy site called http://www.tineye.com/ - TinEye that can do a search for images that are similar to an image you supply. If you find what might be the original source of a rip, please check it carefully to make sure that the original artist and the submitter of the PixelJoint piece aren't one and the same. Artists will sometimes sign up with different names on different sites. If you feel certain you've found a rip, please http://pixeljoint.com/forum/forum_posts.asp?TID=9378#reporthow - submit a report rather than confront the artist directly. Upload your image to an image host, like http://imageshack.us/ - ImageShack or http://tinypic.com/ - TinyPic , copy the direct link they give you, and paste that link into the image tool window on the posting form. Step-by-step instructions for doing this are coming soon. When pixels are submitted, they first go to the public queue for your peers to vote on whether or not they should be allowed into the gallery. Until they accumulate enough "yes" votes, they are not added to the gallery. Some accumulate the needed number faster than others. Others have technical issues, questions or other details holding it back, such as links or unlisted credits or references. It's never personal. Sometimes we just approve it quickly (when it's clear the needed score will be gathered). If your piece doesn't gather enough votes and you'd like some feedback, posting it to the http://pixeljoint.com/forum/forum_topics.asp?FID=8 - work in progress forum is strongly encouraged. The ../projects/lildudes/ - Lil' Dudes and ../projects/wee/ - Wee! projects are no longer accepting submissions for the most part. Exceptions are made when a Lil' Dude or Wee! is of exceptional quality in originality and/or animation. Your Lil' Dude or Wee! is probably sent back because it is similar to another Lil' Dude or Wee! already part of the project. You have to wow PixelJoint for these projects. PixelJoint now has an RSS feed for the news section and chatterbox, but just what is RSS? Check out http://news.bbc.co.uk/1/hi/help/3223484.stm - BBC's user friendly description of RSS and you'll see what RSS is and how useful it can be. You will need an irc program like http://xchat.org/ - XChat for Windows and Linux or http://sourceforge.net/projects/xchataqua/ - X-Chat Aqua for Mac OS X. Firefox has an extension called http://chatzilla.hacksrus.com/ - Chatzilla that works very well too. Once you have this installed just hit the link for the IRC channel under the 'Community' menu above every page. IRC behavior rules are similar to those on the gallery and the forum. Many modern graphics editors support transparency natively, so you can just erase your solid background. Consult your program's documentation for specifics. If your graphics program does not, you can use an online service like http://iaza.com/ - Iaza to do it. Go to http://iaza.com/ - iaza.com and load your image. For Windows users, there's a free program called Giffy which you can use to easily make your images transparent. Download it http://www.brothersoft.com/giffy-16084.html - here . Many browsers do this, unfortunately. There is no fix for most of them. Your best bet is to use http://firefox.com/ - Firefox and follow the directions in http://pixeljoint.com/2009/06/15/2859/Fix_Firefox.htm - this post to see zoomed pixels in all their crisp glory. Note that this is fixed in recent versions of Firefox. Consider upgrading if this is still a problem for you. You can view most specs of an image http://hivemind.in/pj/checker - here . To step through each frame of an animation, check out http://toxicdump.org/labs/frameviewer/viewer.php - this great tool made by our very own http://pixeljoint.com/p/1404.htm - 1ucas . You can use http://hivemine.in/pj/checker - this link to check your challenge entries. Note that even if your entry passes all tests there, it's not a guarantee that it's acceptable for the challenge—there are some things that only a human can verify. The PJ search engine works well with one keyword only, and returns images in the form of a gallery: most useful to find previous images of the subject you have in mind, let's say a http://www.pixeljoint.com/pixels/new_icons.asp?dosearch=1&ob=search&search=dragon - dragon . You can refine your search using criteria such as dimensions, color number, isometric, etc. However if you want to search for pieces featuring a dragon and knight, and http://www.pixeljoint.com/pixels/new_icons.asp?search=dragon+knight&dimo=%3E%3D&dim=10&colorso=%3E%3D&colors=2&tran=&anim=&iso=&av=&owner=0&d=&dosearch=1&ob=search&action=search - use those keywords , you'll only get pieces where those words appear in that specific order: little or nothing. Using Google is better in this case, although the results appear as a http://www.pixeljoint.com/pixels/search.asp?cx=013448474317442146314%3Aw9ybqizwyg8&cof=FORID%3A10&ie=UTF-8&q=dragon+knight&sa=Search#1651 - list without images .